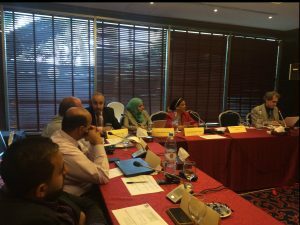 Together with ARIJ (Arab Reporters for Investigative Journalism), a Jordan-based NGO, AREACORE supported two workshops held at the Geneva Hotel in Amman, August 26th-September 1st. Led by the experienced investigative journalist and scholar Dr. Mark Lee Hunter, the participants explored new approaches on how to teach investigative journalism at Arab universities. During the 4-day basic course, instructors from all over the arab world we’re introduced to the ARIJ-developed curriculum for Investigative Journalism. With lively discussions and practical excercises, basic principles and methods of investigative journalism we’re conveyed. In addition to an comprehensive overview over the field of investigative journalims, Dr. Hunter gave creative examples how to teach it to future students. During the 2-day advanced course, professors and instructors, discussed their experience in teaching investigative journalism. Together they exchanged ideas on how to improve teaching practice, to motivate students and to share knowledge. Problems like ethical and legal limitations we’re also discussed in a lively atmosphere. At the end of both workshops, participants left inspired to implement what they’ve learnt at their home universities.